2400 Squadron was formed on 14 December 1949 within Training Command to "maintain and operate radar facilities required by No. 400 (F) Squadron (Auxiliary) and No. 411 (F) Squadron (Auxiliary) for the practice of air interception". The unit was equipped with the AMES-11C mobile radars mounted on trucks. On 22 March 1950, the Unit was renamed as 2400 Aircraft Control and Warning Unit (Reserve). 1 August 1951 saw 2400 AC&WU transferred from Training Command to Air Defence Command. On 1 November 1951, 2400 AC&W Unit (Reserve) was re-designated as 2400 AC&W Unit (Auxiliary). The unit was active in participating and exercising with the Regular AC&W Squadrons. The two most commonly visited units were Edgar and Falconbridge. In 1958, the units new role was to "train Auxiliary personnel including those in the trades of Fighter Controller and Fighter Control Operator in all aspects of air control and warning operations and to maintain and operate radar and communications facilities as directed by AOC, ADC". 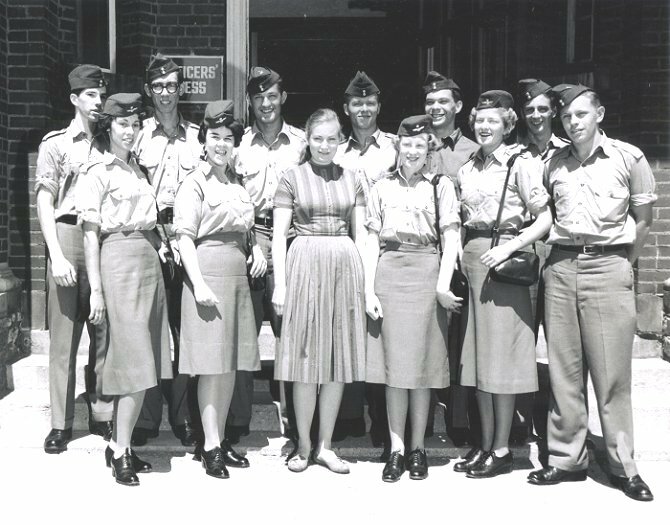 Narrative reports on the Pinetree Line web site confirm that 2400 AC&W Squadron was active at RCAF Station Edgar, ON during the years 1953 to 1959, RCAF Station St. Margarets in 1957, RCAF Station Falconbridge in 1955, as well as RCAF Station Mont Apica in 1952. 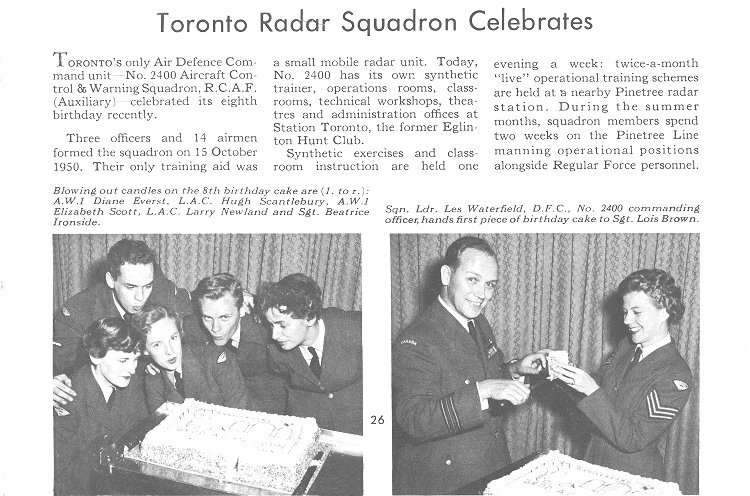 2400 AC&W Squadron was disbanded on 31 January 1961 as a result of the implementation of SAGE into the RCAF. 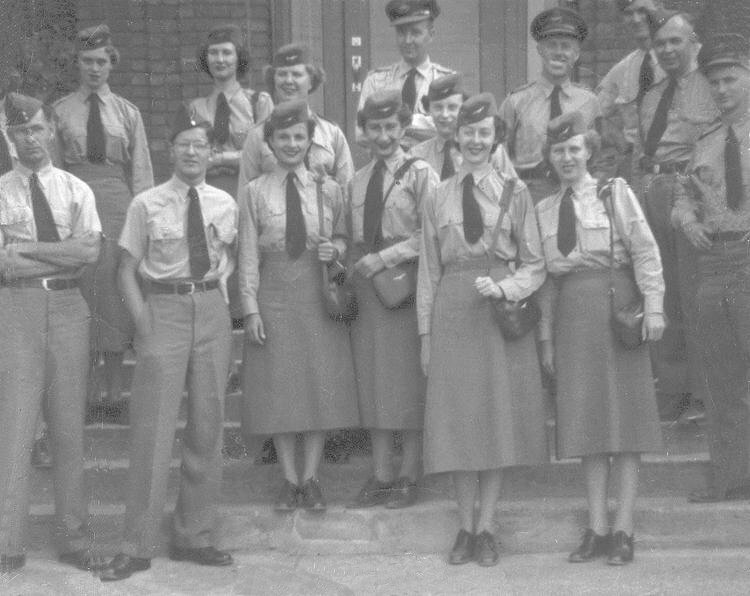 With SAGE, there was no longer a requirement for the Auxiliaries to be trained in manual operations to backup the Regular RCAF AC&W Squadrons. 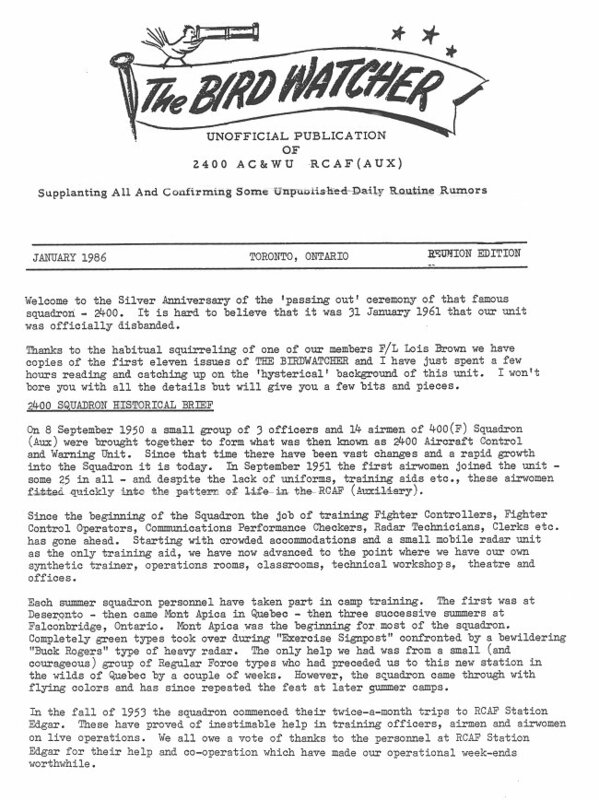 2400 AC&WU Squadron "Bird Watcher" brochure, page 1 - January 1986. Courtesy of Joan Flowers (Hogan). 2400 AC&WU Squadron "Bird Watcher" brochure, page 2 - January 1986. Organization Order R2.0.6 - 3 October 1960. Courtesy National Archives of Canada. 2400 AC&W Squadron FCO course graduation photo. Pete Pedersen front row, far right - 1960. Narrative Report - 1 June 1959 to 31 January 1961. Magazine article pertaining to 2400 AC&W Squadron - December 1958. Organization Order R2.0.0.7 - 1 June 1958. Narrative Report - 1 June 1958 to 30 November 1958. Narrative Report - 1 December 1956 to 31 May 1957. Narrative Report - 1 June 1956 to 30 November 1956. 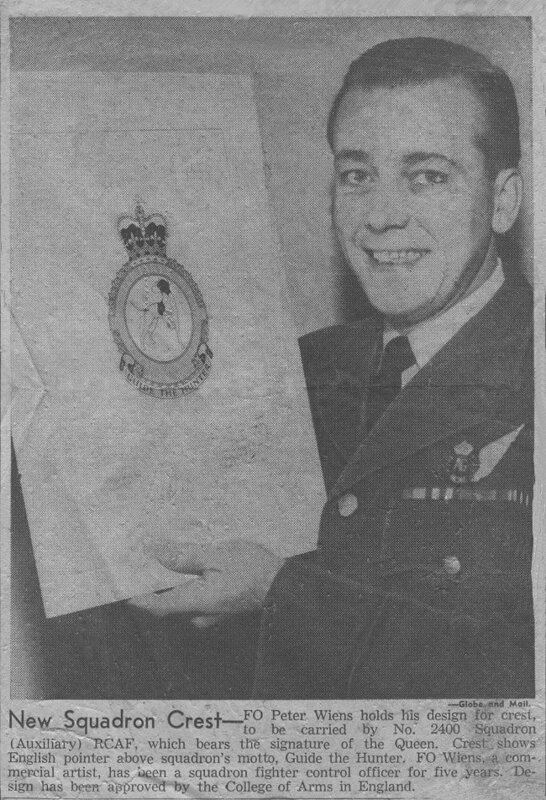 Newspaper clipping of F/O Peter Wiens - 1956. 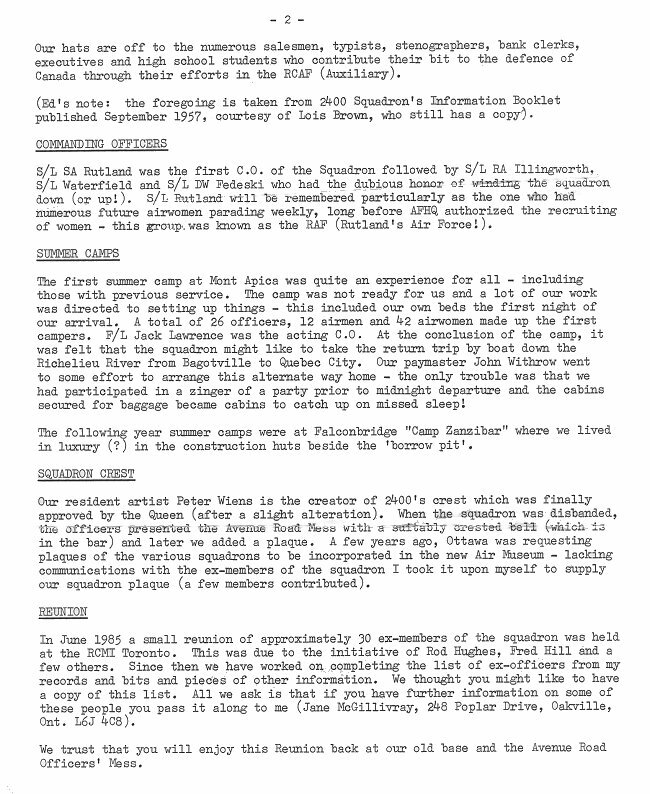 Narrative Report - 1 December 1955 to 31 May 1956. Narrative Report - 21 September 1955 to 30 November 1955. Narrative Report - 11 June 1955 to 28 September 1955. Organization Order R2.2.14.3 - 28 December 1954. Daily Dairy - 1 December 1954 to 31 May 1955. Daily Dairy - 1 June 1954 to 30 November 1954. Daily Dairy - 2 December 1953 to 3 May 1954. 2400 AC&W Squadron (Reserve) personnel at Falconbridge - August 1953. Some of the names written on the back of this photo are: Bea Ironside, Louise Aiken, Mary Austin, Dot Attwell, F/O Gar Cunningham, F/O Bob Smith, F/L John Withrow, Dennison, Julie Konarski, Bobby Balzer, Lorraine Newberry, Mary Gibson, Gerry Brown. 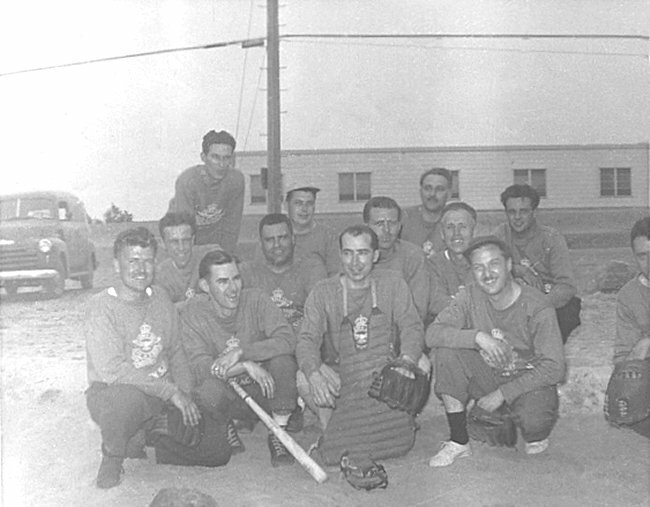 2400 AC&W Squadron (Reserve) baseball team at Falconbridge - August 1953. Some of the names written on the back of this photo are: Jack Meighan, Rick Skilliter, Lehman, Harrison, Bob Cutting, Nick Walker, F/O Bob Smith, Doug Brittnell, Jack Roberts, Roy Ogillvie, F/O Gar Cunningham, Jack Lawrence, Doc Gunn (catcher). 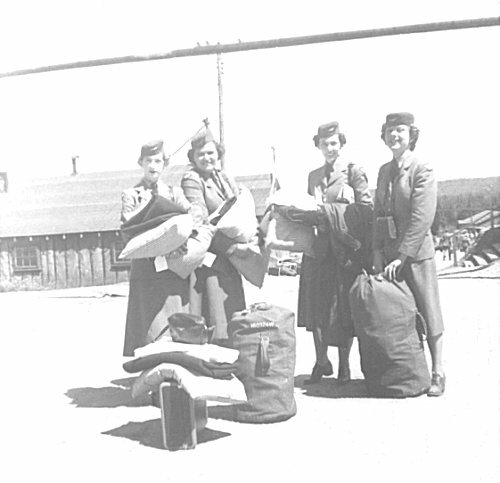 2400 AC&W Squadron (Reserve) Airwomen arrive at Falconbridge - 4 July 1953. (L-R) Shirley Cranfield, Joan Flowers, Freda Manser, Lois Brown. Daily Dairy - 2 June 1953 to 11 November 1953. The Birdwatcher Fourth Edition - May 1953. The Birdwatcher Second Edition - January 1953. Daily Dairy - 17 December 1952 to 2 June 1953. Daily Dairy - 16 January 1952 to 11 December 1952. 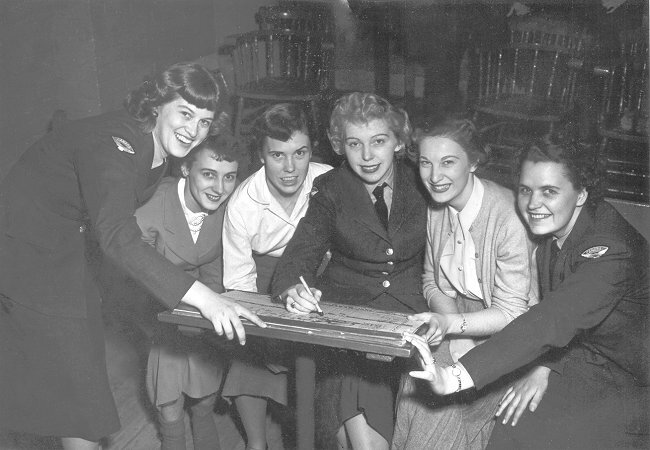 Squadron personnel gathered around a bowling score sheet - October 1951. (L-R) Joyce Clarke, Joanne Barkley, Marilyn Martin, Ruth Tizzard, Joan Terran, Joan Flowers. Organization Order 96/51 - 3 July 1951. Daily Dairy - 1 June 1951 to 3 November 1951. Quarterly Report - 22 January 1951. Organization Order 51/50 - 18 August 1950. Daily Dairy - 15 August 1950 to 31 May 1951.